SAN MATEO, Calif., Feb. 14, 2019 (GLOBE NEWSWIRE) -- SurveyMonkey, (Nasdaq: SVMK) a leading global survey software company, today announced it has launched an integration with Microsoft Power BI. Customers can now easily integrate and visualize business-critical survey feedback to uncover actionable insights, all within the tools they are already using. Customers use SurveyMonkey to understand the “why” behind their data, with enterprise-grade features in privacy, security, collaboration, and compliance. The latest integration with Power BI unleashes the power of data including Net Promoter Score® (NPS®), customer satisfaction scores, and employee engagement data, syncing customers’ survey data from their existing SurveyMonkey Enterprise account directly into their Power BI account. Customers can explore their data and create stunning visuals that can be shared with colleagues on any device. The ability to create and collaborate on customized dashboards enables customers to take action and make informed decisions faster. The portfolio of SurveyMonkey enterprise integrations include Microsoft Teams, OneDrive and Office 365 single sign-on. 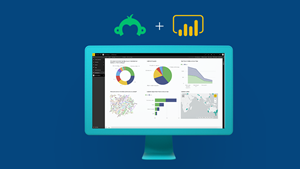 This latest integration is now available to joint SurveyMonkey Enterprise and Power BI customers. Founded in 1999, SurveyMonkey changed the way people gather feedback by making it easy for anyone to create their own online surveys. Our mission is to power curious individuals and organizations around the globe to measure, benchmark and act on the opinions that drive success. Our People Powered Data platform enables organizations of any size to have conversations at scale to deliver impactful customer, employee and market insights. Our 850+ employees are dedicated to fueling the curiosity of over 17.5 million active users globally.